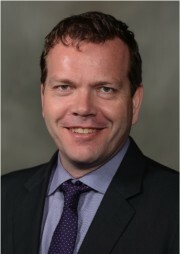 Dr. Niall Ferguson is Head of Critical Care Medicine at the University Health Network and Sinai Health System, and full Professor in the Interdepartmental Division of Critical Care Medicine at the University of Toronto, with appointments in the Departments of Medicine and Physiology, and the Institute of Health Policy, Management and Evaluation. He is a Senior Scientist in the Toronto General Research Institute, and the Critical Care Lead for the Toronto-Central Local Health Integration Network. Dr. Ferguson’s research, which is supported by local, provincial, and national granting agencies, focuses on: (1) mechanical ventilation (epidemiology; weaning and liberation; extubation and tracheostomy); (2) acute respiratory distress syndrome (definitions; ventilatory management; trial design); and (3) novel modes of mechanical ventilation, including extra-corporeal life support. Dr. Ferguson is the Scientific Programme Chair for Critical Care Canada Forum, Canada’s premier critical care conference. He is a frequent invited-speaker at national and international meetings, having given over 350 such talks.